The painting above is another watercolor and it’s about postcard-size. 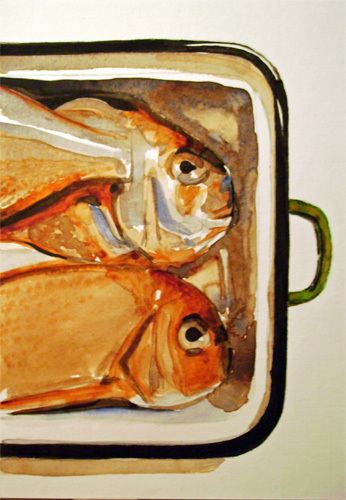 I don’t like eating fish, but strangely enough I like painting fish. Luckily my friends didn’t mind me painting their lunch, though they looked a wee bit confused at first. When hearing of sour I guess most people will think of lemons? Well, at least I do and that’s why I choose to paint them for this weeks IF theme. 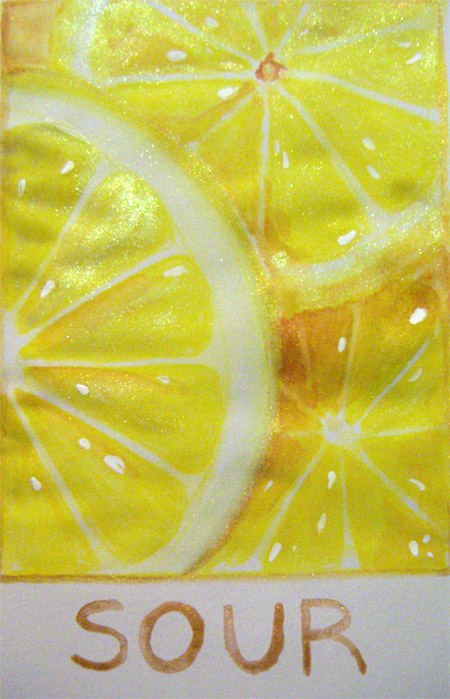 I love lemons, don’t you, too? They are one of the best sources for Vit. C! This painting however is also a homage to American water colors. Why? I got myself some tubes of Daniel Smith and M Graham water colors some months ago, but used them only occasionally… first they seemed pretty normal (or should I have said average? ;p), nothing special compared to the W&N and Schminckes I usually would paint with, but when I turned on the lights in the evening and had again a look at my paintings I noticed some kind of glimmer when the light hit my paintings from certain angles. I just say one word: mica. Do they put mica into all of their paints? Actually I don’t mind, it looks rather discreet and is really only then noticeable when the light hits from a particular direction, yet then it appears strange if the whole picture wasn’t painted with the same brand of colors, b/c the W&Ns or the Schminckes look matte next to the Grahams especially. You are currently browsing the Watercolor category at : silviasblog.com :.